I have to start out saying that I was not sure if I would like this book or not...of course, I can say that with most new authors- I am quite comfortable with my circle of writers and am never sure if I should leave my comfort zone and try a new one. I am so glad I took a chance on this one.The opening paragraph just transported me to Jamus' realm. There are descriptions, and then there are descriptions James Fuller style. I have been reading Science Fiction and Fantasy for a good 35 years, and very rarely has an author captivated me from basically the first paragraph "The moon was full and hung proud in the peak of the heavens, offering its mystical glow to the dark world below. The stars littered the obscurity above in random fashion-as if someone had poked countless holes through a sheet of black linen. It was a tranquil night by even the hardest of men's standards. But it was lost on one...." at that point, you could not have gotten me off my recliner to do anything, although I had to fix supper for the family, but I did it with my kindle in hand.What can I say about the characters? Jamus- husband, father, seeker of justice for the atrocities committed against his family...amazingly well written, very deep emotions. Mr. Fuller made Jamus leap off the page and appear before my very eyes, I could see the pacing, I could hear the raspy ruined voice. His sense of justice is sooo right. Sofia- beloved daughter. Stolen away from home. We can feel her bewilderment at what has happened, her anguish. Lord Carter...What a despicable excuse for a man...the man oozes slime with his every look. I have never been so happy to hate a character as I was him.Unforgivable was absolute excitement to read, and I loved every minute of it...I was on the edge of my seat at several points, sure that Jamus was about to meet his maker. The story unfolded at just the right pace for me. I have to admit to being a tad taken aback at the ending, but that is what made it such an excellent book...that unexpected ending! Well done Mr. Fuller, Bravo! Once again, I swayed out of my normal paranormal genre to take a dive into the world of author James Fuller and what a surprise I received! Non-stop action, horror, drama & heart-breaking emotional scenes that left me cheering & crying at the same time!We meet Jamus, a man out for well-deserved revenge, after the brutal murders of his wife & son and the kidnapping of his daughter, Sofia.. He will not rest until the monsters who committed this atrocity are brought to his very own personal kind of justice..The emotions written into this story are just purely amazing! My heart literally ached when the horrible people were torturing Jamus's family... I cried with pain to see what Jamus had to watch & go through... I laughed with him when he had successes & his revenge campaign started to work!This truly is one amazing novella & for lovers of horror/thriller/fantasy type books, you do NOT want to miss this book!! I'm looking forward to Part 2 and can't wait to get lost in the next amazing book by this author! ~Reviewer: Vicki Rose~~~~~~~~~~~~~Platinum Reviews gives James & "Unforgivable"4.5 PLATINUM RINGS! As a parent, most of us know the lengths we would go to to protect our children. Jamus experiences the same emotional rollercoaster when he entire life is torn apart by an evil and twisted Lord. All Jamus wanted to do was protect his family, mainly his young daughter. His act of protection backfired and now he is on a path of vengence. Fuel by hatred, anger, revenge and the need to save his daughter, Jamus heads down a dark path while trying to hold on to his humanity. ***While this book is not from my usual genre I found it full of suspense and it kept me drawn in. James Fuller did a great job of character development. He makes the reader feel for Jamus and hate Lord Carter. Warning...this book does contain suggestively dark material that involves young children. Keep in mind it is only suggestive. The book is very detailed even if a bit gory. Fuller also ended to book leaving the reader wanting more. 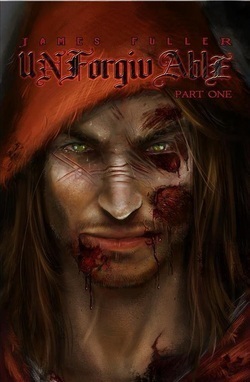 I will definitely read the next book Unforgivable Part Two. James has written a tale of revenge that is both shocking and understandable. Jamus just wanted a peaceful life with his family. When Lord Carter decided he wanted Jamus' daughter, Jamus respectfully declined saying his daughter was too young.Well, Carter is not one to take no for an answer. His henchman go and do unspeakable things to Jamus and his family and steal the daughter.Jamus survives and seeks revenge and the chance to rescue his daughter.Lord Carter shows how much he will do to get what he wants. He will do ANYTHING. The characters are so well-developed. You feel for Jamus and hate Carter. It is easy to find yourself routing for Jamus in his terrifying actions. No sympathy is ever going to be aroused for Carter.This is a dark tale about an evil that is all to prevalent. It is something every parent worries and wonders about. Very graphic and very well written!Another masterpiece from James! Bring on book two!!! This book is definitely an “adult” novel. It is very well written and makes you gasp in disbelief multiple times. It has a great plot line and action that never falters. This is a man you root for, with every death you want to give him a high five and tell him good job. You can see the struggle between his conscience and his rage and it gives him a humanity that you did not expect. Set in an era long ago, you can feel the presence of the time around you. James did a wonderful job illustrating the setting through his words and the cover designer did a spectacular job capturing the face of Jamus. This book is a very gritty story, and something to not be overlooked. People with light stomachs might not like it but if you like a story full of blood, fighting, and lots of awesome killings I definitely suggest it! Aside from not realizing how graphic it was I really enjoyed it. I already started the second one and I cannot wait to finish it! What a great story! As you can tell from the blurb, Jamus sets outs to avenge the deaths of his family and save his daughter from the perverted Lord Carter. I will warn you that it is a bit gruesome. I'm all for guts and gore but this book still got to me. A few words of advice on reading this book: 1) don't read this book in public, ie. the train. People tend to look at you funny when you're wincing while reading. 2) this book has one scene that is hard to swallow and just happens to be towards the beginning. I'll admit, I was close to bawling my eyes out on the train. Can you say embarrassing? Yeah... Anywho... Unforgiveable is a heart wrenching, action packed journey of what a father is willing to do for the safety of his daughter. If you are looking for a happy ending, you wont find it here. I definitely recommend this book. Received this book from the author as an ARC in exchange for an honest opinion. This is mine. When first started reading this book I really didn't think it was my cup of tea. However he more I really and got to know all the characters , it had me siting on the edge of my seat!!!!! The story opens where the kings men are coming to collect a young girl from the house as payment. The father defies the guards. In the process the mother, and little brother are killed, the guards also believe that they have killed her father. See, this is where the story really starts to get good. And if I told you more, than you would not want to buy James Fuller's book. And it is a definate hot read !!!! It's mind blowing!!! Looking forward to book 2 .. Dark, fast paced, and explicit imagery are just a few of the discriptives I use for this tale of vengence. The first chapter was like a punch to the gut. I feel so much pain for the main character Jamus and his family and revel with him as he completes each step in his journey to avenge them. I look forward to starting the second instalment of this graphic and gritty story.Side Note:From chapter one I was cussing and threatening to stab, dismember and burn the antagonists of this story! A book of vengeance is nothing without its bad guys and these were some serious Bastards!!!! You did a fantastic job James Fuller. Unforgivable was a read that from the very beginning demanded my attention. I find it interesting how easily I sided with a cold blooded, brutal, killer and I didn't flinch when `justice' was served. The author did a superb job in describing his fight scenes. I felt that there could have been more story worked in. More of a journey and perhaps more time to get to know the family. It takes great bravery to go to the dark places this author went, it's a risk I am glad he took. I see this book becoming a movie,or perhaps a great graphic novel. Revenge served hot. The concept of pushing through inconceivable odds to avenge wrongful deaths drives this story. The flashback sequences really help to fill out the book. That really seems to be all there is to this though. Flashback/horror/flashback/bloody vengeance/flashback... I would have liked to know more about some of the other characters introduced. UnforgivableBloody good book. I can imagine the rage and anger in this heartbreaking story. Threadbare no words to express this.